The Lightning is a 19 ft., sloop-rigged Sparkman & Stephens designed dinghy, sailed by a crew of three. At 700 pounds it is dry sailed and easily trailered. With 150 active fleets worldwide, the Lightning Class is the largest multicrew one design in the world in terms of number of fleets, active class members, and regatta participation. Lightnings are very technical to race due to a hard-chine hull and abundant sail controls. The Lightning Class has a high level of competition in one-design racing. Many families compete together on a local and national level. It is amazing how all of the talented people in the class are so willing to share what they know and to help make the class better. Many of the top sailors consistently give clinics and talks at regattas as well being there to answer any questions on sail trim, tactics, boat handling, etc. This is what really makes the class keep going strong and will keep it that way for many generations. 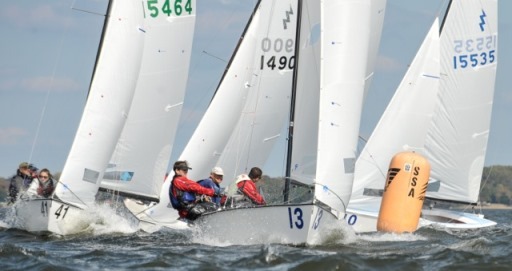 SSA has an active fleet, running the No-Gas Regatta in the spring (which typically is combined with an educational program) and the Frigid Digit Regatta in the fall (which draws a competitive fleet o approximately 40 boats). 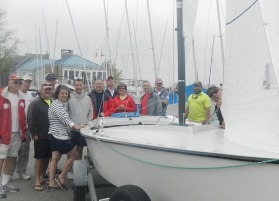 In addition many choose to sail weekday evenings, including the Tuesday night races. There are many nearby regattas including Washington, D.C.; Havre de Grace, Maryland; Wrightsville, Pennsulvania; and Moneta, Virginia. For those who choose to sail on a National level, they travel to the Atlantic Coast Championships (which SSA hosted in 2010), the Southern Circuit in Florida, the North American Championships (SSA hosted in 2000 and 2007), and the World Championships. There is plenty of opportunity to race for those who want to, at all levels. SSA Fleet members range from North American Champions to beginners. Socially, we gather after our races, and at parties throughout the year while not on the race course. We have a boat for you to try out--contact us for additional information. For additional information on the fleet, please feel free to contact our fleet captain or any member of our fleet.